Solaris Hydroheater - Perfect for Viscous Slurries - Hydro-Thermal Corp. The Solaris® features a cross flow diffuser that injects steam across the entire cross-section of flow to ensure thorough mixing and a uniform temperature profile. It utilizes low shear flow, making it ideal for slurries with high solid contents and process fluids where chunk size must be maintained. Hydro-Thermal’s heaters are exclusively designed and patented direct steam injection heaters that looks like any 3-way valve but instead are unique industrial heating devices. The internal parts precisely mix metered amounts of steam directly with a liquid or slurry, providing instantaneous transfer of heat from steam to the liquid. Steam immediately condenses, eliminating hammer and vibration, plus causes a turbulent mixing action that self-cleans the unit. Two distinct, yet interrelated, properties for effective and uniform heating of liquids or slurries are used. These methods maximize control of the process for accurate temperature control, smooth operation and the flexibility to optimize performance under varying conditions. Assure precise steam control and produce predictable results based on the position of the stem plug. A variable-area steam nozzle meters steam flown at the point where steam and liquid first contact and mix. 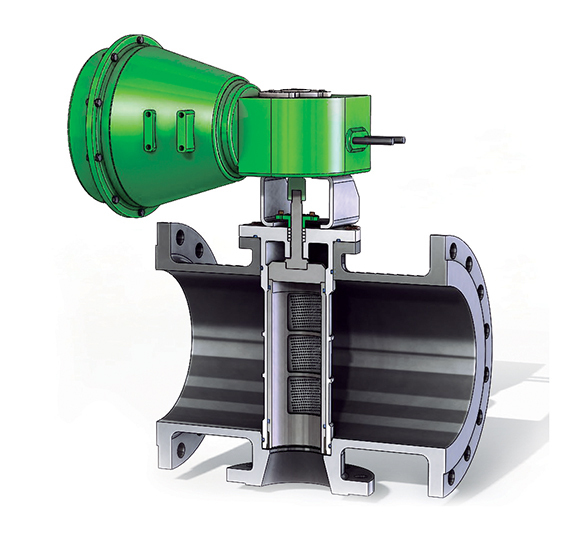 This technique eliminates the need for an external steam control valve. Only the cross sectional area of the steam nozzle moves which provides process stability through a much wider variation of your process conditions. The process of accelerating a vapor to maximum velocity by creating a pressure differential through an engineered nozzle. Establishing choked flow precisely controls the heating of the liquid by metering the steam mass flow. When operating under choked flow, the steam velocity will be constant which prevents liquid pressure fluctuations from affecting the discharge temperature. The result is extremely precise temperature control with instantaneous steam mixing and condensation. The Solaris is made for your specific operating conditions. We need to know a little bit about your process and plant set-up in order to design the heater or skid that will work best for your conditions. Please fill out this form or contact us here.